Wendell Berry’s poetry has struck a chord for alumnus and adjunct music professor Andrew Maxfield. Experiencing Berry’s poetry as a missionary inspired Maxfield to compose choral music for a few of Berry’s poems as his Honors capstone project while at BYU. 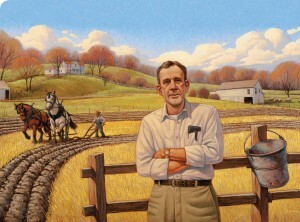 What started out as an ambitious undergraduate project eventually turned into an enormous collaborative and artistic endeavor resulting in the 2013 two-disc CD set Celebrating Wendell Berry in Music, featuring choral and folk arrangements of a selection of Berry’s poems and new recordings of the poet reading his works. The album artwork for “Celebrating Wendell Berry in Music”, painted by Greg L. Newbold (BA ’92) depicts the esteemed poet on his Kentucky farm. Soon Maxfield began expanding the project, enlisting the Salt Lake Vocal Artists to perform his choral works on the first CD and Grammy-nominated singer-songwriter Eric Bibb to write and perform the music on the second CD. Even though they had never met, Maxfield approached Bibb after one of his shows in Chicago and told him about the Berry music project, giving Bibb a copy of A Timbered Choir. Bibb immediately loved Berry’s poetry and agreed to join the project. “Andrew’s a very focused and ambitious musician, and I recognized a kindred spirit in him,” says Bibb. That earthy, soulful quality of Maxfield’s music has produced surprising results. The album, which is available online and at multiple independent bookstores, has sold across the country and in Europe, and recently the Roosevelt Institute featured a performance of the music at their Four Freedoms Awards in New York City on the night they presented Wendell Berry with the 2013 Freedom Medal.